The instant the whirring noise begins, the quadcopter leaps from the ground and high into the sky. It’s almost faster than your eye can see. 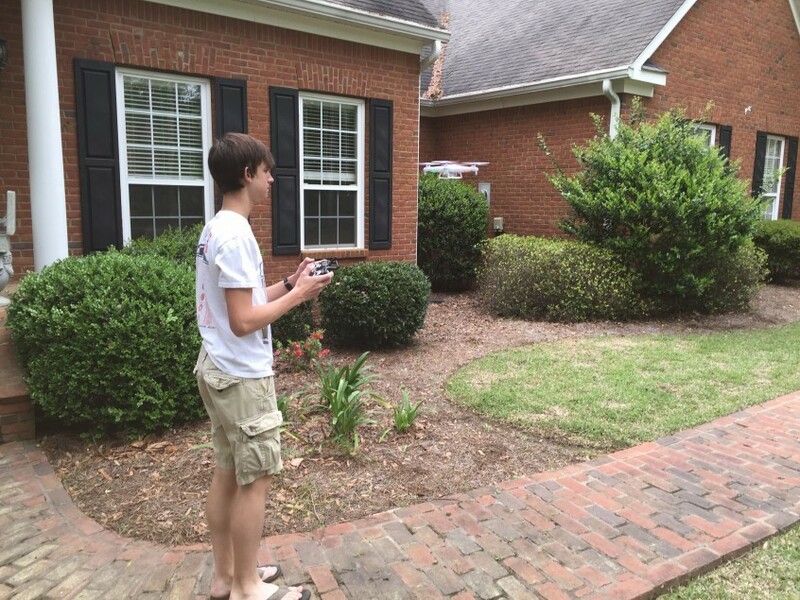 My 15-year-old son, Robert William, was excited to fly his first quadcopter. It’s a light, propeller-driven device that includes a video and still camera. The first Saturday after the drone arrived, we took it to a football field near our home. It was a bit windier than we wanted but he was too excited to be deterred. Shortly after liftoff, I was immediately impressed by how high the drone was able to fly. For a couple of seconds, I took my eyes off the drone to watch Robert. He was starting to work the controls erratically. The drone wasn’t responding to his commands. He managed to get it to turn back from a tower next to the field, but that’s when it started flying farther away. Higher up, the wind was too much for the drone. Robert lost control and the drone flew off. Wow, he was completely devastated. His new drone, gone. To buy the drone just a few days before, he’d used all of the Amazon gift cards he’d received for Christmas from his aunts, combined with the money he’d earned cleaning offices. Now the thing was flying away. Soon it was out of sight beyond the treetops. The drone is so small and hard to see, I thought for sure it was gone forever. Still, Robert was clearly upset, so I suggested that we get going to see if we could find it. We knew our only chance was to try to catch up to it before the battery died. If we could do that, we’d be able to turn on the controller and use the sound of the propellers to help us find the drone. We followed the drone’s path into a neighborhood behind the school. After walking up and down the street, Robert turned on the controller. Within a few moments we heard the whirring of propellers. His drone landed in the middle of a vacant lot, in between several large oak trees. It was a miracle. Although it landed hard, it was recovered! Robert’s been careful about his drone ever since. And he’s gotten really good at flying it. In fact, he’s been reaching out to real estate professionals, roofers, and construction contractors to create sales videos for their businesses. Robert understands the FAA prohibition of commercial use of drones. And, in fact, he’s decided that while aerial videos capture attention, telling the story of the home is what’s most important. To systemize the process, he’s created a standard storyboard. He’s outlined the shots he takes to “tell the story of the home.” After a few seconds of external aerial video, he highlights the kitchen and bathrooms together with the other exceptional features of the home. He puts those together with a few aerial videos, and he’s got an interesting video to watch. Robert is onto an important marketing lesson: it’s all about the story. Your members and potential members want to be entertained, enchanted, and excited. Stories create a connection that’s more powerful than logic. Stories create a relationship; they build trust and they form a connection that’ll turn your customers into members for life. Stories allow the listener to incorporate the lesson of the story in their own reality and therefore it becomes part of them them in a way that “just telling them” something cannot do.